Rickenbacker International Corporation announces acceptance of orders for the John Kay Limited Edition. John Kay, as founder and leader of the legendary rock group, Steppenwolf, has been an integral component in forming the Los Angeles music scene since the 1960's with such monster hits as "Born to Be Wild". John Kay and Steppenwolf continue to perform to sold out concerts throughout the world. 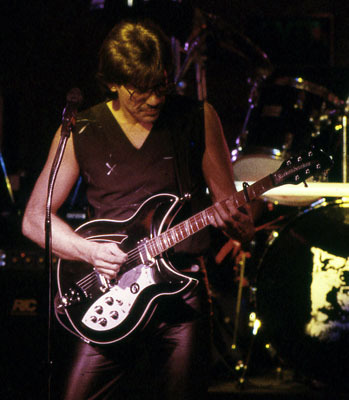 The John Kay Limited Edition incorporates elements of the Rickenbacker 381 he used in early Steppenwolf days with additions for active electronics and personalized appointments. The instrument features two HB-1's, Rickenbacker's newly designed humbucking pickup, active and passive modes, lead phase switch and a four position rotary switch which offers various combinations of single coil and humbucking pickup configurations. The guitar offers stereo and monaural outputs and includes unique appointments such as silver pickguard, Jetglo finish and silver nameplate. John Kay offered over 25 years of professional experience in design specifications for this instrument. The Company considers the electronics as leading innovations in offering a variety of tonal qualities and electronic configurations. "The look of the guitar is something I am particularly pleased with. Since I am totally color blind, I gravitate towards high contrasts, hence the black and silver combination. I enjoyed designing what I think is a striking instrument, which is made with much skill and care in the USA." "In these times of stamped out imitations, it is a pleasure to be associated with something genuine and of high quality." "Hope you feel the same." A limited number of instruments will be manufactured. Each instrument will be accompanied by a numbered Certificate of Authenticity and Origin. The list price is US$1699. A hard shell luggage case is included.